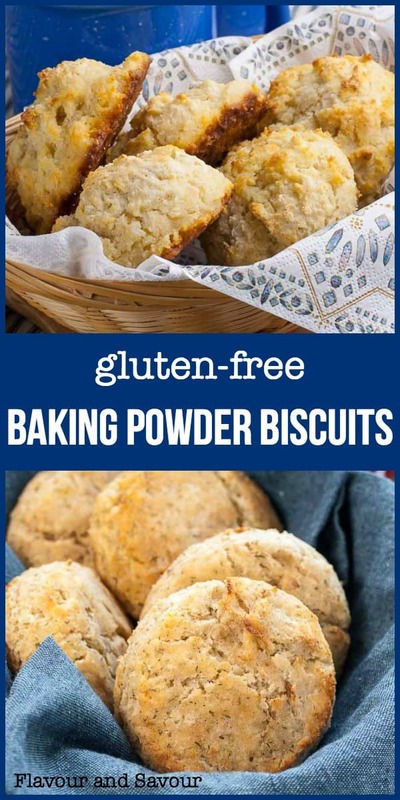 These Herbed Gluten-Free Baking Powder Biscuits are simple to make with a handful of ingredients and a gluten-free flour mix. 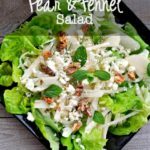 Great with soup or any dinner! Are you missing wheat in your diet? 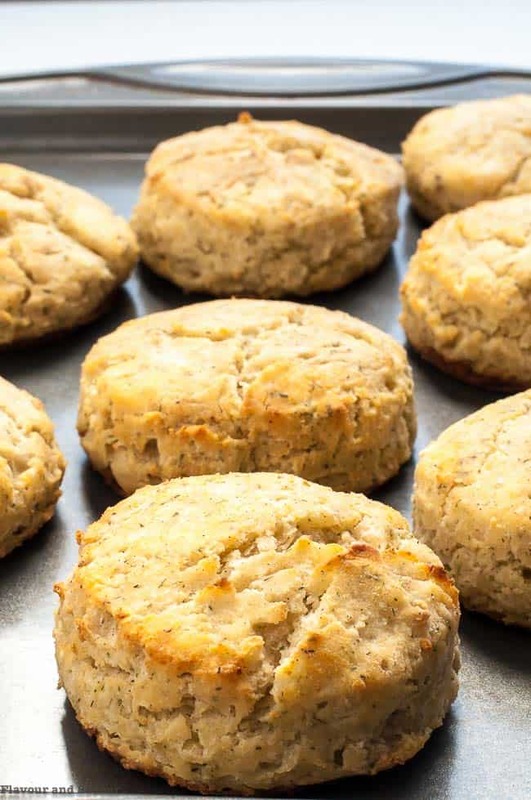 One of these herbed gluten-free baking powder biscuits with a smear of butter will satisfy that craving! 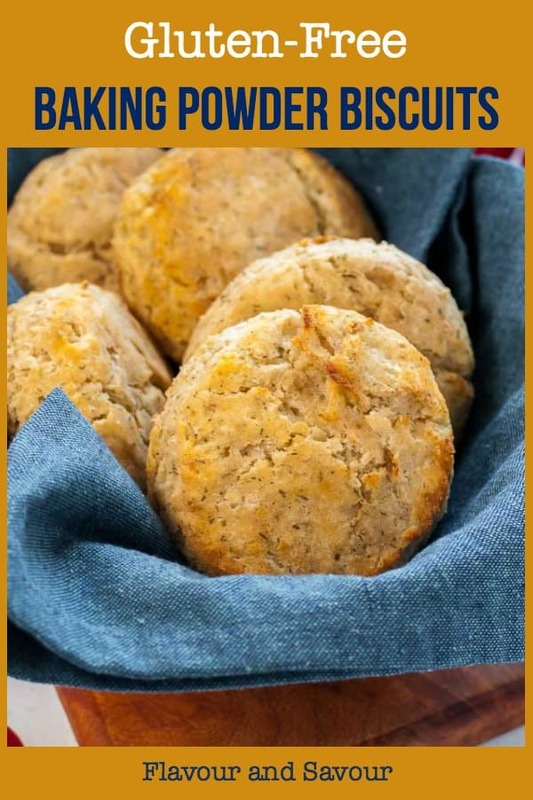 These biscuits are made with a 1-1 gluten-free flour blend (I used Bob’s Red Mill). 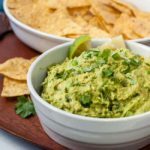 They have a slightly crunchy texture on the exterior and a soft and chewy interior. Best of all, they’re very easy to make. Whip up a batch while your soup is simmering or your dinner is cooking and you’ll be the Best Mom (or Grandma) Ever. 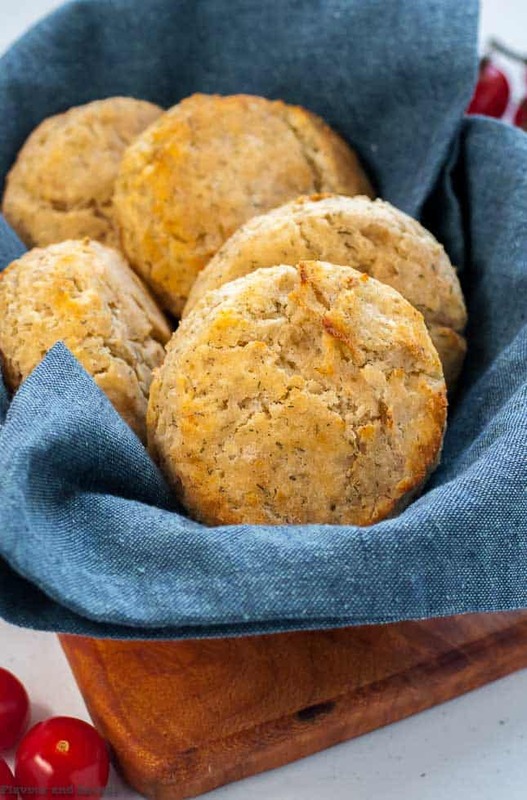 There’s nothing as welcome to accompany a meal as a fresh-from-the-oven homemade baking powder biscuit! And when it’s gluten-free, it means we can ALL enjoy one, with no discomfort. 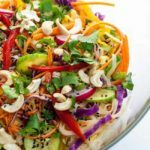 A food processor makes this recipe a breeze. Pulse the dry ingredients, add the frozen butter and pulse until the mixture looks like coarse meal. 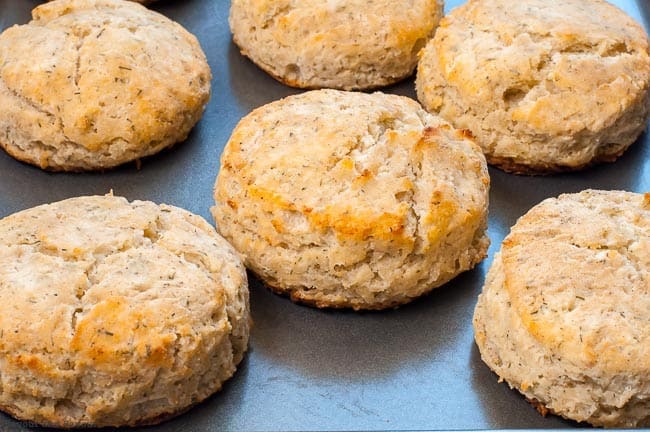 Don’t over mix, as the pea-sized pieces of butter are essential to help the biscuits rise. Combine buttermilk and egg, then add this mixture to the dry ingredients. Turn the dough out on to a board dusted with gluten-free flour. The dough will be sticky. The lightly dust the top of the dough with more flour and press it into a disc, about 1 1/2 inches thick. Using a biscuit cutter, cut 8 biscuits. Re-form the dough into a small disc and cut 2 more biscuits. Transfer to a lined baking sheet, then bake for 10-12 minutes until golden. Cool before eating. Freeze the butter! Tiny chilled morsels of butter melt while baking. The water content in the butter converts to steam, creating small pockets which help to lift the dough, causing it to rise. 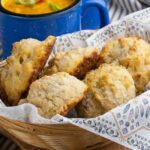 These little pockets give the biscuits a softer, fluffy texture. For this reason, it’s important to work quickly and not overwork the dough. 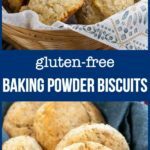 Are these gluten-free baking powder biscuits as tender and flaky as those made with wheat flour? No, of course not. But they’re a great substitute for those who can’t tolerate gluten. 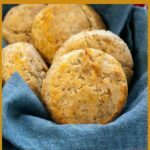 If you don’t want to cut them with a biscuit cutter, make drop biscuits instead. Simply scoop and drop on to a baking sheet and bake as the recipe recommends. Get the butter! 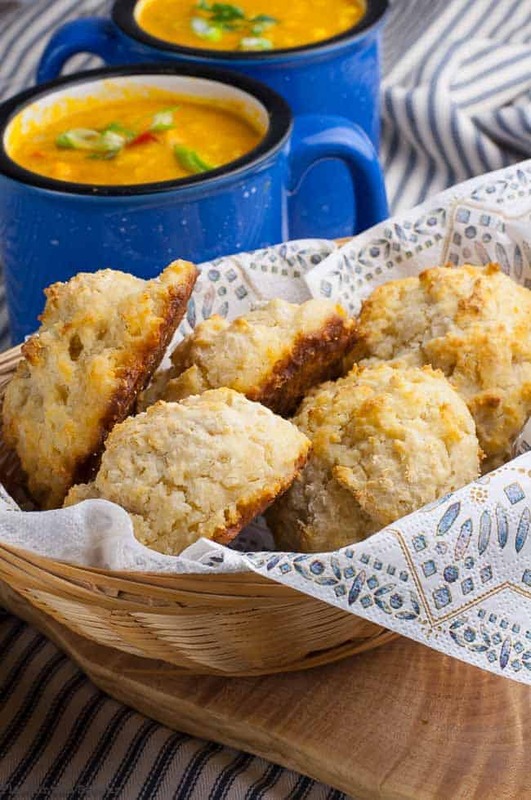 These biscuits are delicious served with soup, or with any meal. Make them to go with this Sweet Potato Corn Chowder or Instant Pot Broccoli White Cheddar Soup. If you make them, I’d love to hear if you liked them. Let me know in the comments section below. Measure 6 tablespoons of butter. 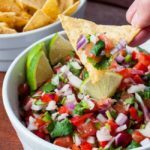 Cut into small pieces, transfer to a dish and freeze for 15 - 20 minutes. In the bowl of a food processor pulse the dry ingredients: flour, baking powder, salt, sweetener and herbs. Alternatively, whisk dry ingredients in a medium bowl. Add the frozen butter and pulse a few times until mixture has the consistency of coarse meal. Alternatively, use two knives or a pastry blender to cut in the butter until only pea-sized pieces remain. Mix buttermilk with ricotta cheese and whisk in the egg. If you don't have buttermilk, substitute 1 cup whole milk mixed with 1 tablespoon vinegar. Add the buttermilk mixture to the dry ingredients and stir until well combined. The dough will be wet and sticky. Turn out on to a board dusted with flour. Use your hands to gently press into a disc about 1 1/2 inches thick. Dust the top with a little more flour. Use a 2 - inch biscuit cutter to cut 8 round biscuits. Press the remaining pieces of dough into a smaller disc, handling as little as possible and cut 2 more biscuits. Transfer to the prepared baking sheet. Bake for 10 - 12 minutes. Cool before eating. They will be gummy when warm, but their texture improves when cooled. These biscuits were a big hit, especially while they were still a little warm. I made them as drop biscuits. So easy. Will be making these again soon!